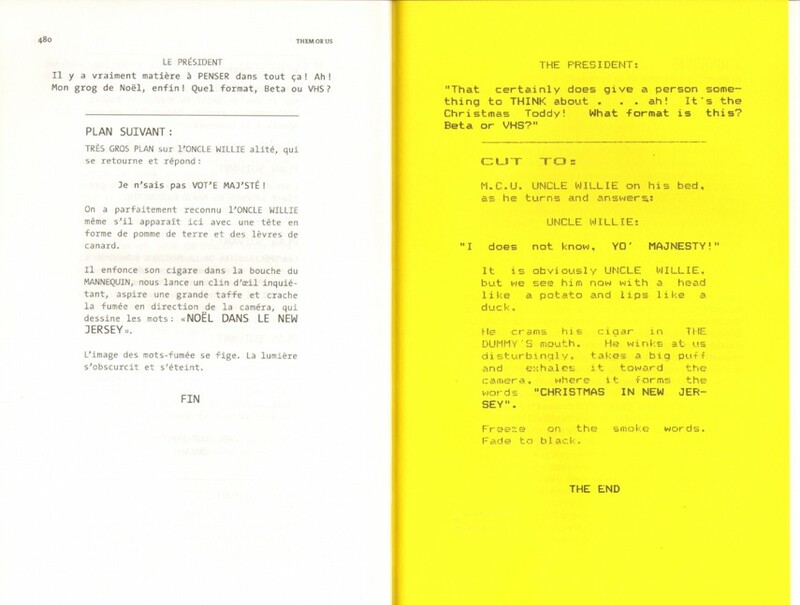 This screenplay seems to be made up from different separate stories. 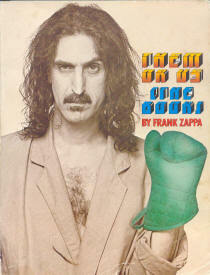 Parts of this book you can find in other screenplays by F. Zappa – Dwell and Hunchentoot. Read the C.Ulrich comments on Dwell page. 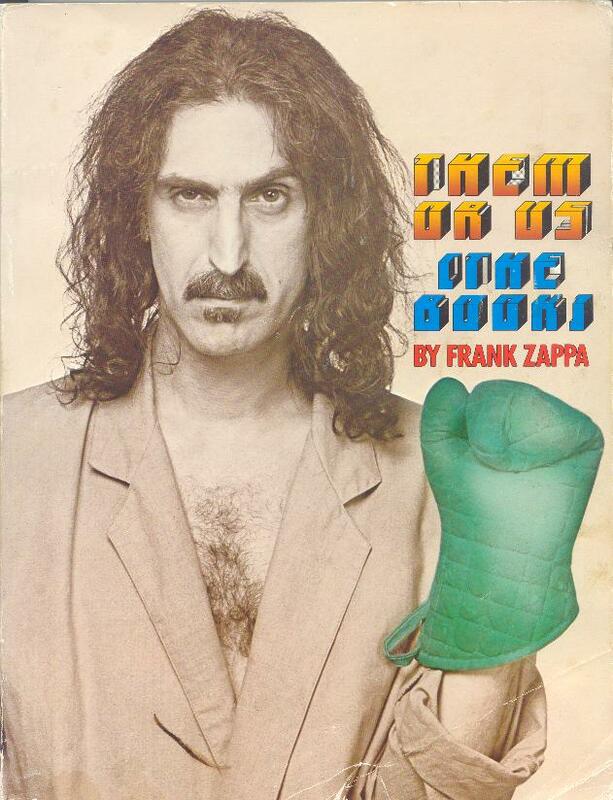 This cheesy little homemade book was prepared for the amusement of people who already enjoy Zappa Music. It is not for intellectuals or other dead people. The book is written in quasi-screenplay style and contains tons of conceptual continuity stuff. 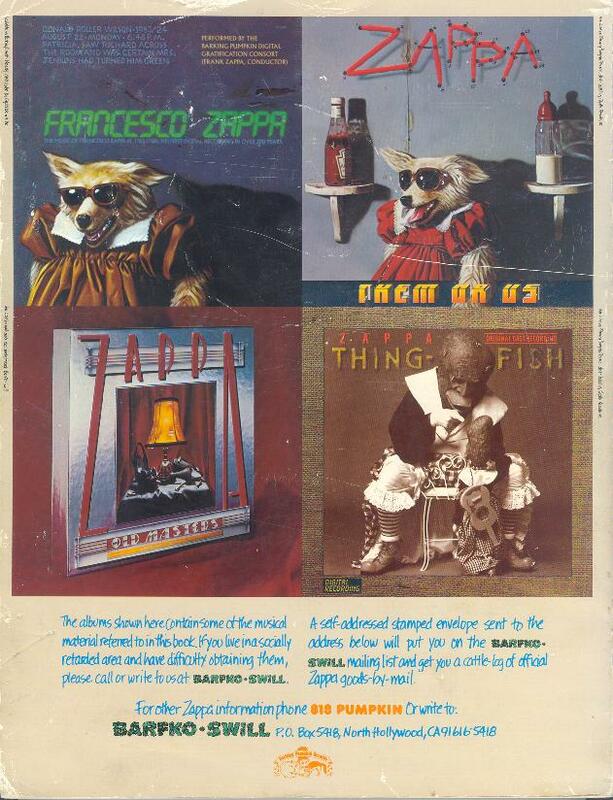 It is partly narrated by Francesco Zappa, that obscure 18th century Italian composer, who in the book is now a short, paunchy man in his 50's living in New Jersey. 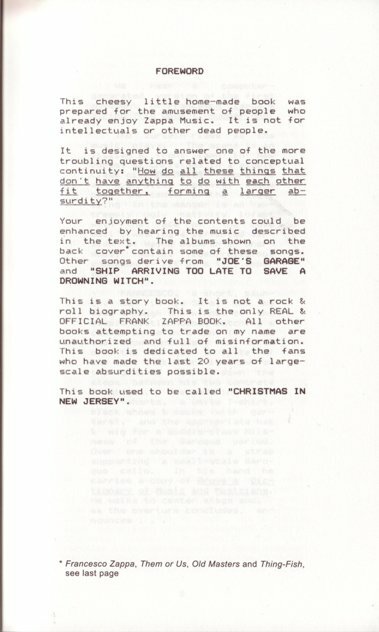 I would have to say that the book is for fan's of Frank's work and it is those people who would find it hysterically funny. This is facsimile edition and exactly copies all the content pages of the original edition. The cover is slightly changed. 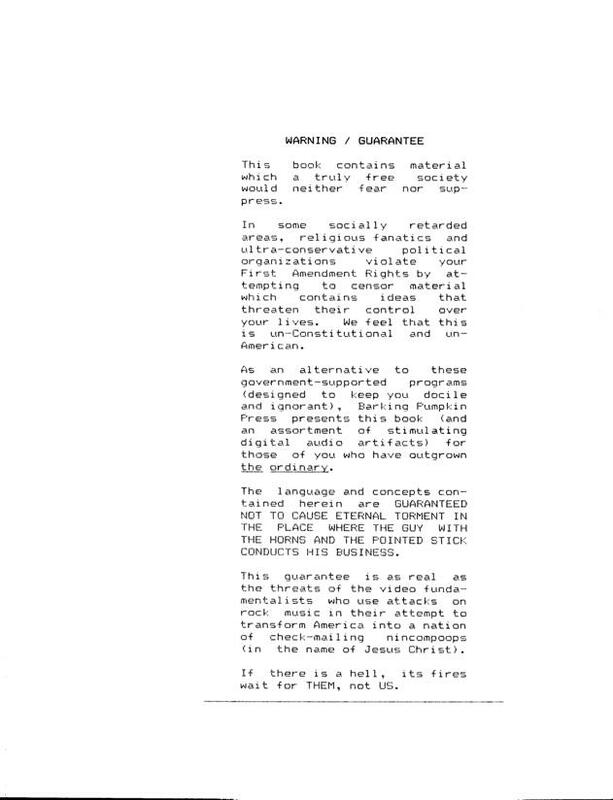 Big change is format, which is half of the original edition. 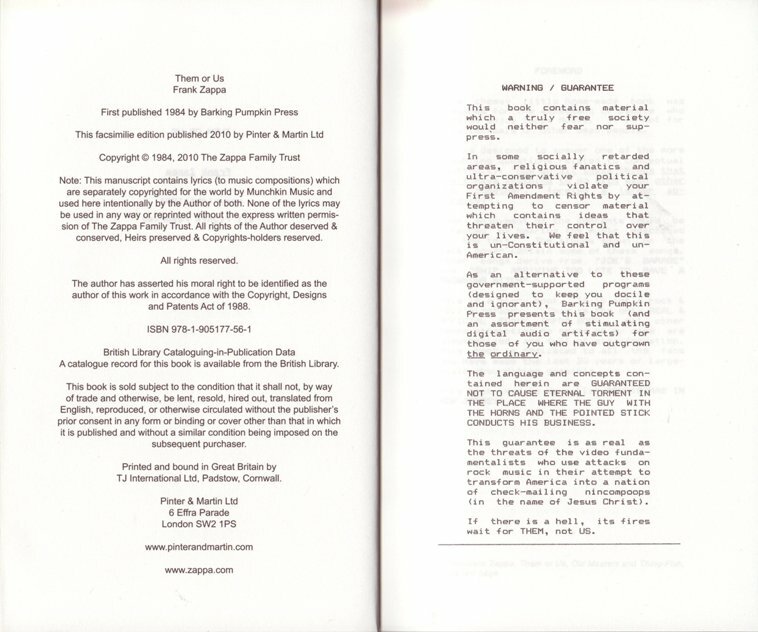 Publisher Pinter & Martin can ship only to UK. For the rest of the world - try BookDepository. 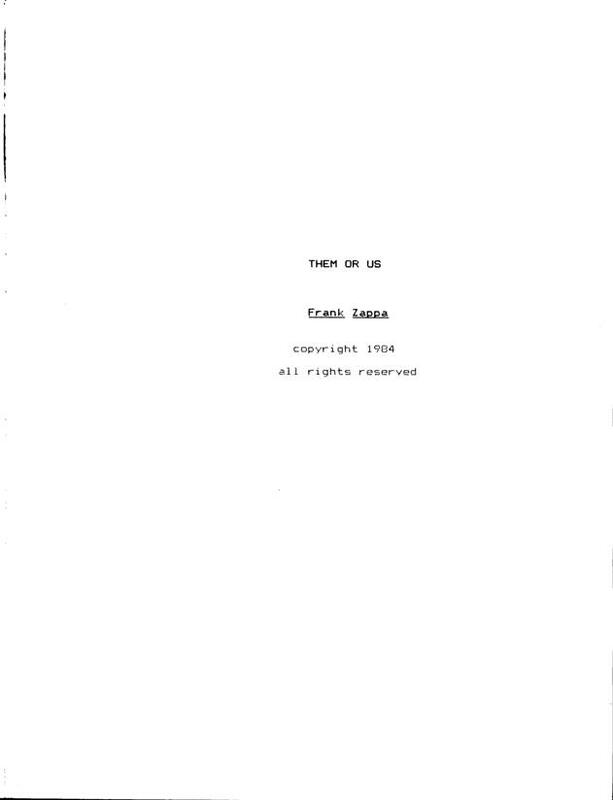 "In 1984 Frank Zappa self-published Them or Us, created with a dot matrix printer. This facsimile edition brings this seminal work on conceptual continuity to a new generation of fans who have outgrown the ordinary." 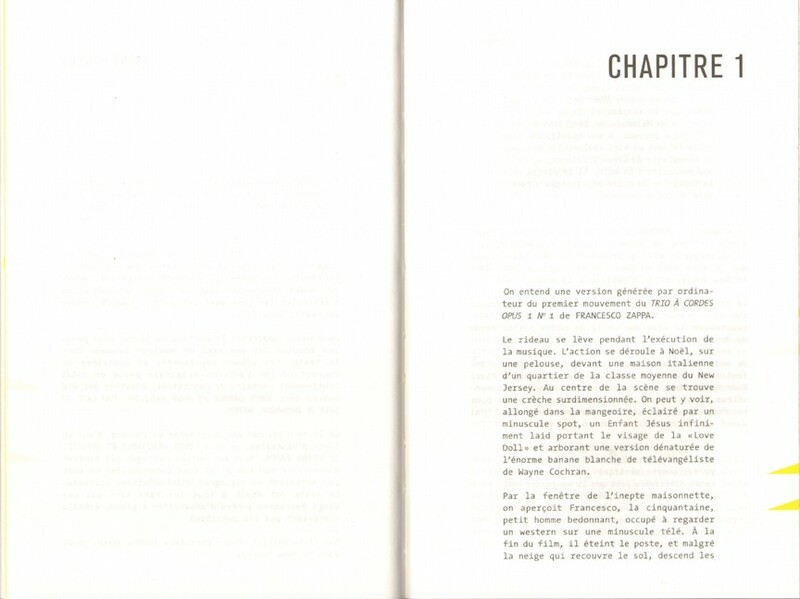 This is a French translation by Thierry Bonhomme. 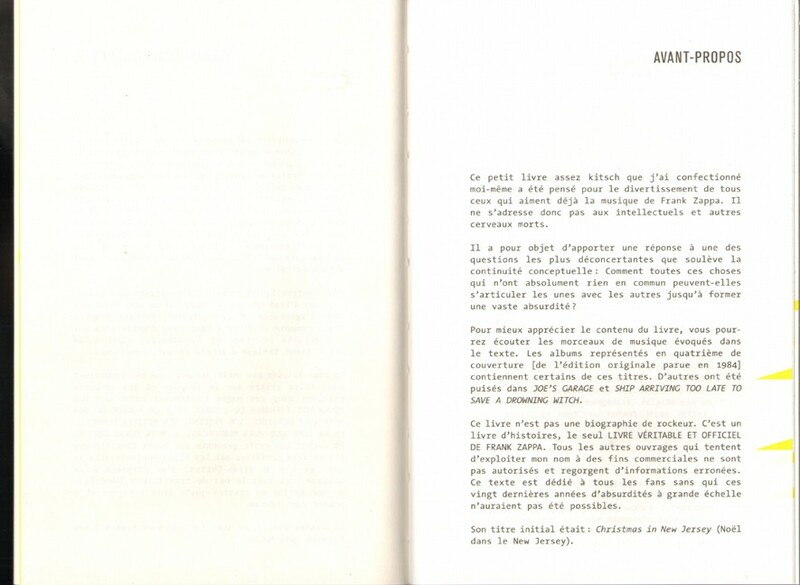 The book includes preface by Guy Darol and afterword by Pacôme Thiellement. 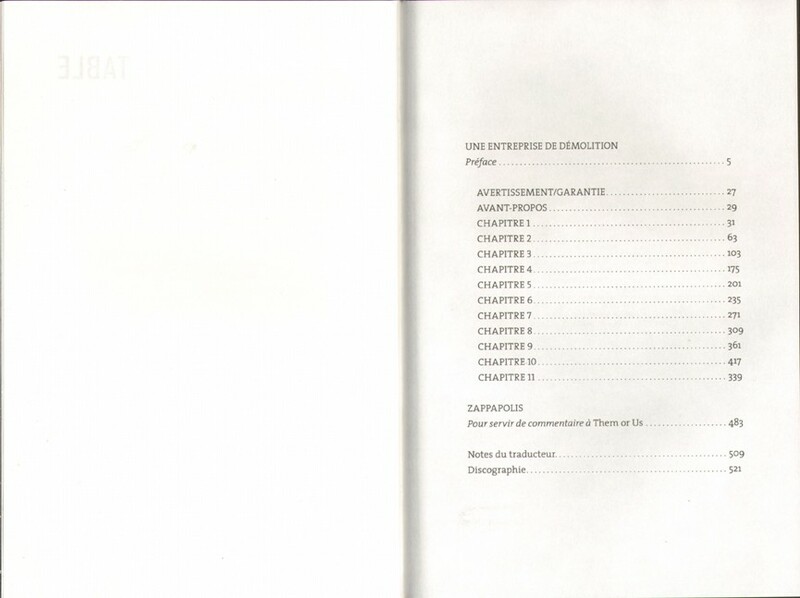 Ce livre n'est pas une biographie de rockeur. 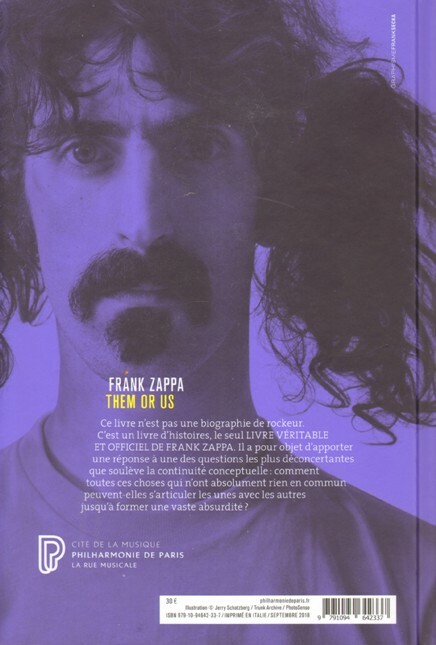 C'est un livre d'histoires, le seul LIVRE VÉRITABLE ET OFFICIEL DE FRANK ZAPPA. 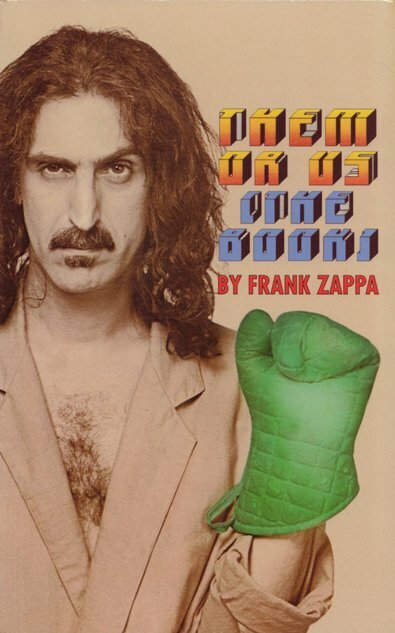 Livre légendaire, pour la première fois accessible au lectorat francophone, THEM OR US est la Bible des fans de Frank Zappa. À mi-chemin entre le scénario de film et le cut-up inspiré par les écrivains de la Beat Generation, le texte mêle les personnages, les imaginaires et les positions politiques de Zappa à des passages issus de différents albums (notamment Joe's Garage et Thing-Fish). Le musicien avait conçu ce livre en pur autodidacte, de l'écriture à la mise en page de l'édition originale (ce dont témoignent les pages fac-similées qui jalonnent cette édition française). 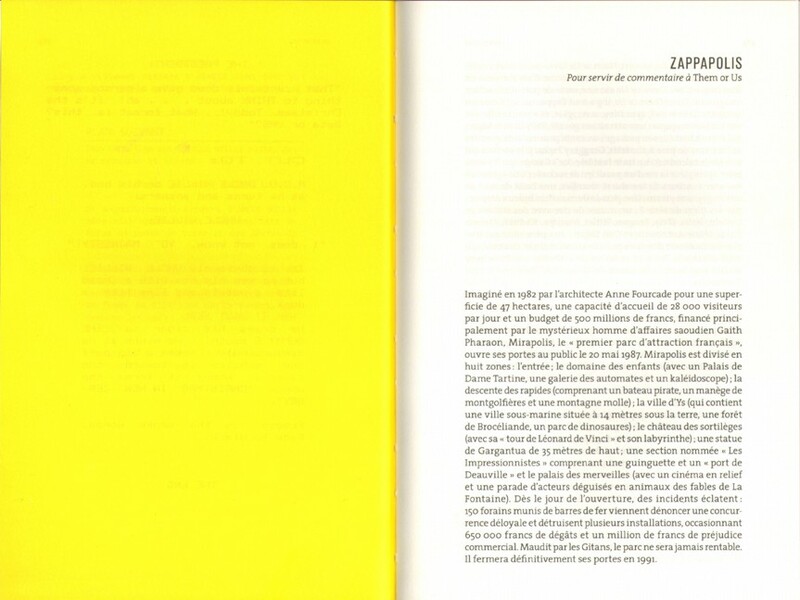 Une œuvre littéraire inclassable dont la lecture éclaire tout l'univers de Zappa. This book is not a rocker biography. 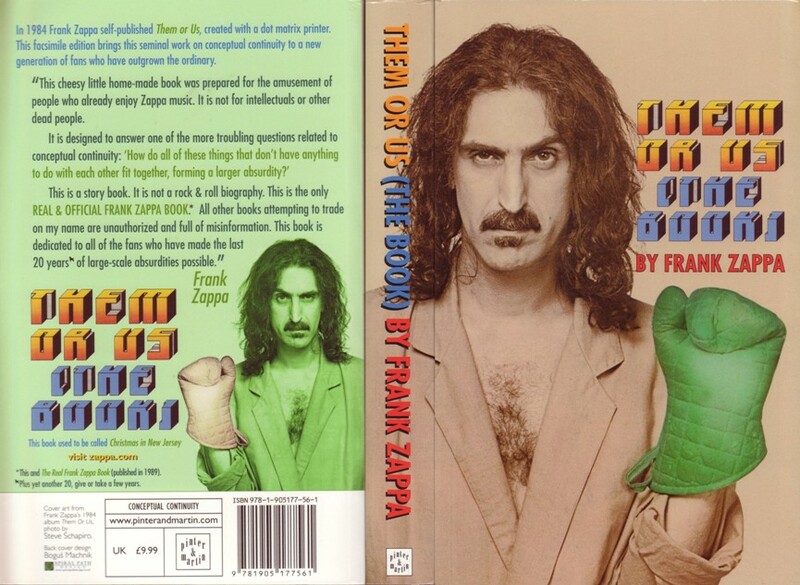 It's a storybook, the only REAL AND OFFICIAL BOOK OF FRANK ZAPPA. 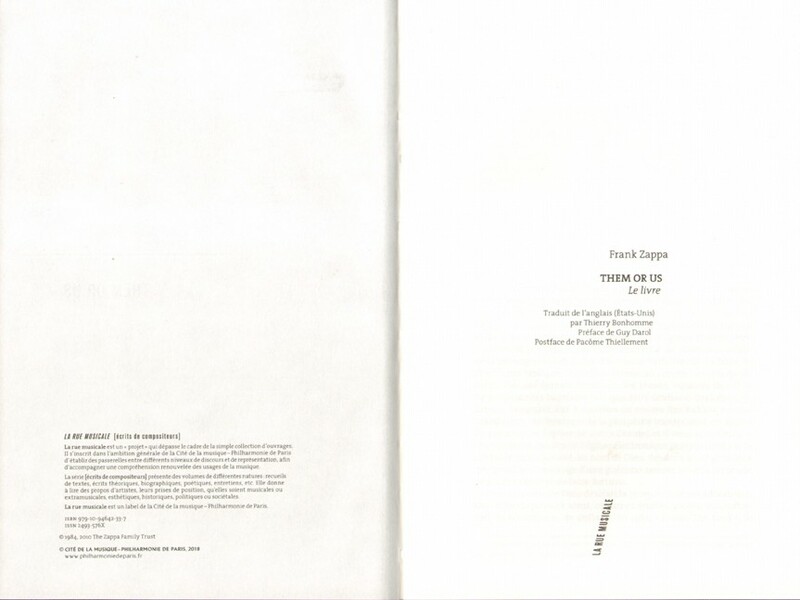 A legendary book for the first time accessible to French readers, THEM OR US is the Frank Zappa Fans' Bible. 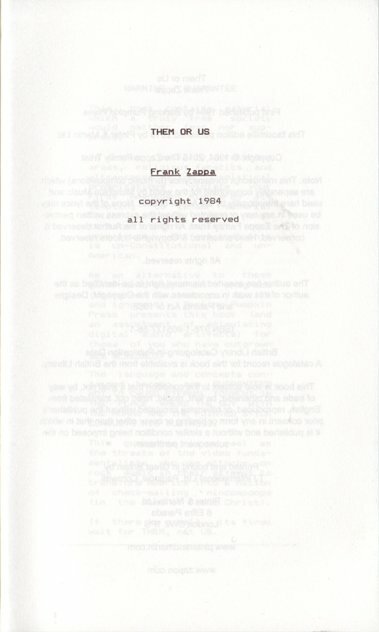 Halfway between the film script and the cut-up inspired by the writers of the Beat Generation, the text mixes the characters, the imaginations and the political positions of Zappa to passages from different albums (including Joe's Garage and Thing -Fish). The musician had conceived this book as a pure self-taught, from the writing to the layout of the original edition (as evidenced by the facsimile pages that mark out this French edition). 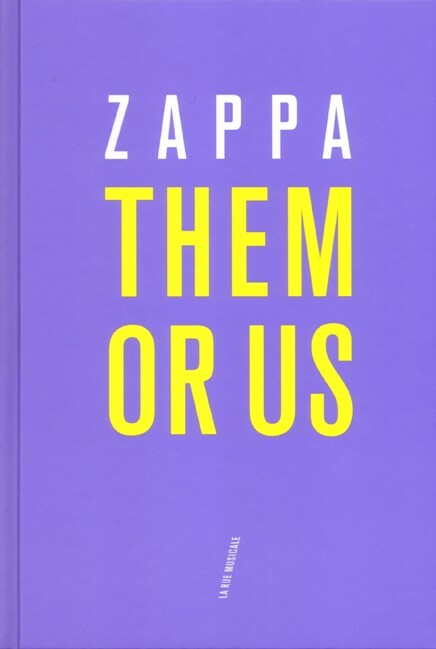 An unclassifiable literary work whose reading illuminates the entire universe of Zappa.